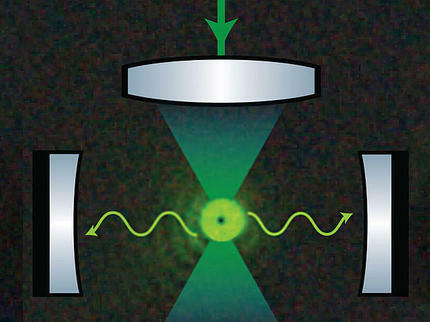 A tightly focused laser field traps a nanoparticle between two highly reflecting mirrors, i.e. an optical cavity. Preferential scattering along this optical resonator allows to induce cooling of the nanoparticle motion in all three directions. When a particle is completely isolated from its environment, the laws of quantum physics start to play a crucial role. One important requirement to see quantum effects is to remove all thermal energy from the particle motion, i.e. to cool it as close as possible to absolute zero temperature. Researchers at the University of Vienna, the Austrian Academy of Sciences and the Massachusetts Institute of Technology (MIT) are now one step closer to reaching this goal by demonstrating a new method for cooling levitated nanoparticles. Tightly focused laser beams can act as optical "tweezers" to trap and manipulate tiny objects, from glass particles to living cells. The development of this method has earned Arthur Ashkin the last year’s Nobel prize in physics. While most experiments thus far have been carried out in air or liquid, there is an increasing interest for using optical tweezers to trap objects in ultra-high vacuum: such isolated particles not only exhibit unprecedented sensing performance, but can also be used to study fundamental processes of nanoscopic heat engines, or quantum phenomena involving large masses. A key element in these research efforts is to obtain full control over the particle motion, ideally in a regime where the laws of quantum physics dominate its behavior. Previous attempts to achieve this, have either modulated the optical tweezer itself, or immersed the particle into additional light fields between highly reflecting mirror configurations, i.e. optical cavities. However, laser noise and large required laser intensities have posed a substantial limit to these methods. "Our new cooling scheme is directly borrowed from the atomic physics community, where similar challenges for quantum control exist", says Uros Delic, lead author of the recent study published in Physical Review Letters by researchers at the University of Vienna, the Austrian Academy of Sciences and the Massachusetts Institute of Technology (MIT), which was headed by Markus Aspelmeyer. The idea goes back to early works from Innsbruck physicist Helmut Ritsch and from US physicists Vladan Vuletic and Steve Chu, who realized that it is sufficient to use the light that is scattered directly from the optical tweezer itself if the particle is kept inside an initially empty optical cavity. A nanoparticle in an optical tweezer scatters a tiny part of the tweezer light in nearly all directions. If the particle is positioned inside an optical cavity a part of the scattered light can be stored between its mirrors. As a result, photons are preferentially scattered into the optical cavity. However, this is only possible for light of specific colors, or said differently, specific photon energies. If we use tweezer light of a color that corresponds to a slightly smaller photon energy than required, the nanoparticles will "sacrifice" some of their kinetic energy to allow photon scattering into the optical cavity. This loss of kinetic energy effectively cools its motion. The method has been demonstrated for atoms before by Vladan Vuletic, a coauthor of this work. This is, however, the first time it has been applied to nanoparticles and used to cool in all three directions of motion. "Our cooling method is much more powerful than all the previously demonstrated schemes. Without the constraints imposed by laser noise and laser power quantum behavior of levitated nanoparticles should be around the corner", says Delic. U. Delić, M. Reisenbauer, D. Grass, N. Kiesel, V. Vuletić, and M. Aspelmeyer; "Cavity cooling of a levitated nanosphere by coherent scattering"; Phys. Rev. Lett. ; 122, 123602 (2019).